Donna Kooler, founder, president, designer, and creative director, graduated from art school in Los Angeles in the 50's. 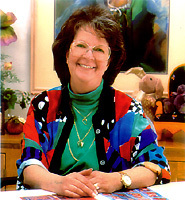 In 1973 she became Design Director for Sunset Designs, a needlework kit company in Northern California. Donna started her own company, Kooler Design Studio, Inc. in 1985. She takes great pride in a company, which has so many talented and creative people, and attributes the success of the Kooler Design to not only a great staff, but also the wonderfully supportive companies she has the pleasure of partnering with over the years. "As a group, our mission is to provide quality products to our customers who take pleasure and pride in stitching and displaying our designs in their homes. We are committed to this goal and it shows." Click here to see Donna's books. We'd love to hear from you. Your questions, comments, requests, and suggestions are always appreciated, so please go to our Contact Us page.